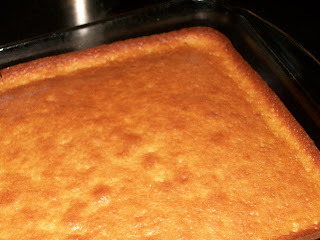 Yellow cake from a mix. 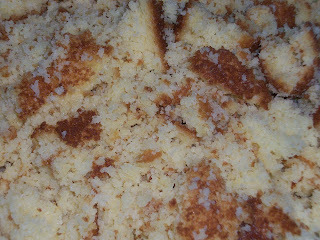 Bake a cake from a mix. Use yellow, or butter. The original recipe where I saw this said you can use butter pecan. That sounds good, but the store I was in didn't have any butter pecan, so I just used yellow. Once the cake has cooled break it up into a large bowl. The recipe said to use a can of frosting, but I made my own. I just melted about 3/4 of a stick of butter, added some powdered sugar til I got the right consistency, and just a tiny splash of milk. Add the frosting mixture to the cake and combine well. Meanwhile, melt some chocolate in a double boiler. I used dark chocolate wafers from the Ben Franklin I told you about in my last post. Form cake mixture into balls. 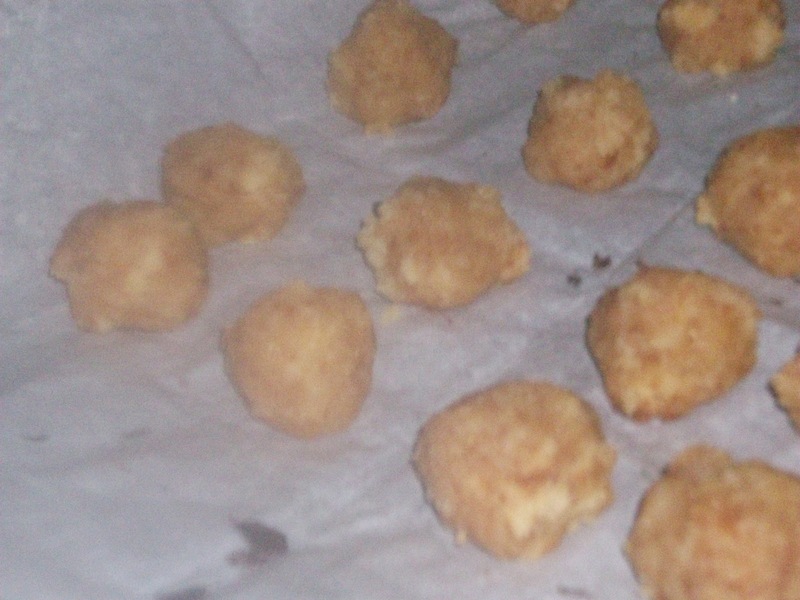 Pinch off small pieces of the cake/frosting mixture and form into balls. 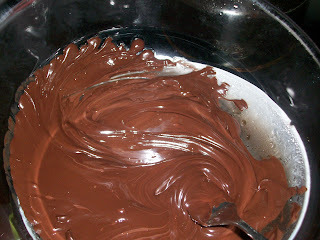 Then dip the balls into the melted chocolate to cover them. 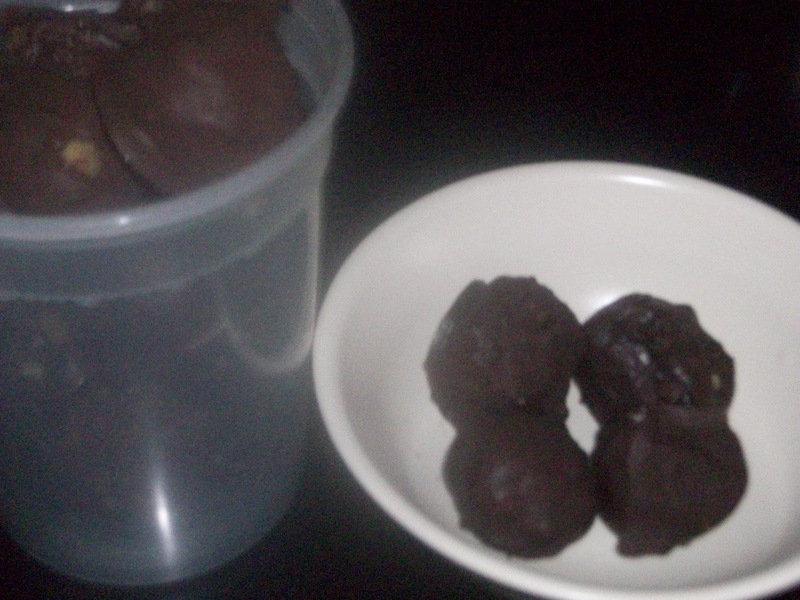 Place the chocolate covered cake balls onto a parchment paper lined cookie sheet. Then put the cookie sheet into the freezer for a little while until the chocolate is set. I don't know what these taste like because I gave up sugar for Lent, and that means no cake, frosting, chocolate, cookies, pies, candies, or anything else that tastes good and sweet. Except peanut butter. No jelly. I'm also working on my food picture taking skills. But several people complimented me on these cake balls, so I'm assuming they're pretty good. I mean, really. Cake, butter, sugar, and chocolate. How bad can it be? !